5 | 482 students enrolled. 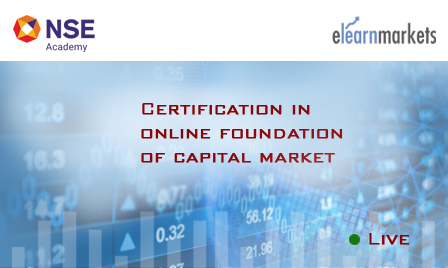 Certification in Online Foundation of Capital Market course is jointly certified by NSE Academy & Elearnmarkets (NSE Academy is a subsidiary of National Stock Exchange of India). This course focuses on creating a powerful insight into the various tools and techniques required to understand the size, structure and functions of capital markets. It gives a basic understanding of capital market instruments like Equity, Debt, Currencies, Derivatives, Financial Planning and many more. This course is a perfect combination of Fundamental Analysis, which shall help the investor to pick the right company and Technical Analysis, which aids one with the understanding of charts and Derivatives which shall teach how to trade , knowing the risk appetite and return profile of the investor. Certification in Online Foundation of Capital Market course aims to equip the incumbents with necessary theoretical knowledge and practical application on stock markets so that students can apply the same in researching equity markets for wealth creation. It is a basic course on Capital Markets that introduces you to the process of how to find and analyze companies, determine the risk of a stock investment or trade, proper entry and exit time of the stock, understand the movements of the market, and helps you to choose the right trading style for your personal goals using correct approach to financial planning. Students enrolling for Certification in Online Foundation of Capital Market program will be given a “Certificate of Completion” from NSE Academy, facilitated by Kredent Academy. The participants will also be given free access to related webinars conducted by Kredent Academy for further knowledge enhancement. An email query support, Question & Answer community platform can also be availed by the student for any kind of doubt clearance related to content while pursuing the course. How to get marcoeconomic data? Certification in Online Foundation of Capital Market is designed for freshers and graduating students who would like to get introduced to the basic market terminologies and concepts. This course benefits new investors, retail traders, and financial service professionals by enhancing their existing knowledge base. Under this course “Certification in Online Foundation of Capital Market”, the participant will be required to appear for the internal examination and NCFM examination. Please note that the participant will get the Certificate of Completion of Certification in Online Foundation of Capital Market after successfully clearing both the examinations. NSE Academy Certification in Financial Market (NCFM) Examination: This examination is hosted by NSE for which you need to go to the NSE approved test centre. The participants have to appear for the NCFM Financial Market: Beginner’s Module, preferably within 45 days after the completion of the module/ course. Once the student enrolls in the Certification in Online Foundation of Capital Market, he/she has to do NCFM registration. This is necessary in order to get the login credentials, so as to book the test date and the test centre to give the examination. Click here to register. The exam fees for the NCFM Beginner’s Module is Rs 2,006 (two thousands six only) inclusive of service tax.